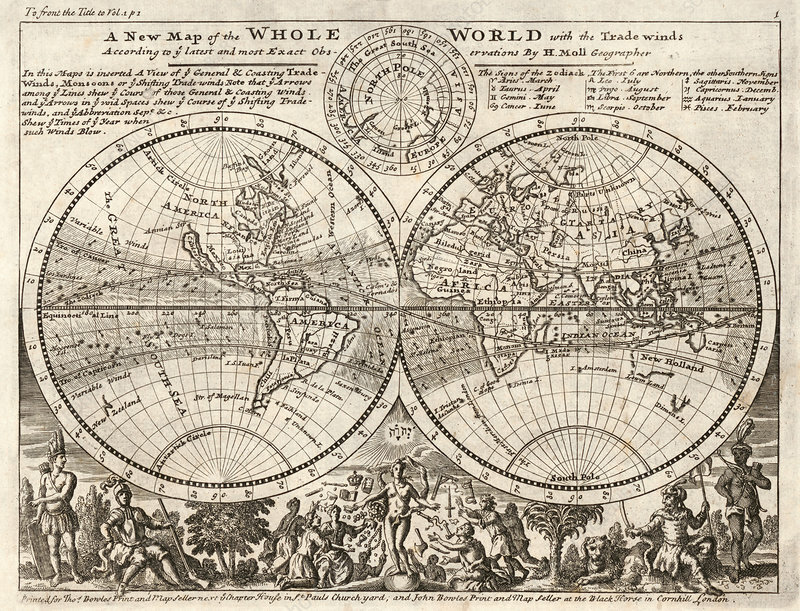 A new map of the whole world with the trade winds according to ye latest and most exact observations, 1729. Includes illustrations, small north polar projection hemisphere, and text. Herman Moll (1654-1732), was a London cartographer, engraver, and publisher. During the 1690s he published his first major independent work, the Thesaurus Geographicus. The success of this work likely influenced his decision to start publishing his own maps. In the years that followed he brought out several volumes including Fifty-six new and accurate maps of Great Britain, a book of maps of the British Isles. In 1711 he began his Atlas Geographus, which appeared in monthly deliveries from 1711 to 1717, and eventually comprised five volumes. This included a full geographical representation of the world in colour maps and illustrations.